I liked this article because it seems that all of us had a challenging year this year. 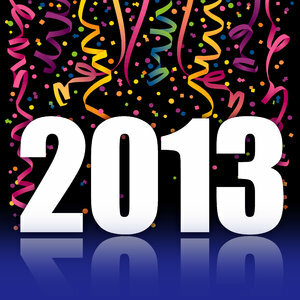 What will 2013 bring us? Some of us personally, some from a business perspective and many of us faced challenges on both fronts. As always, I’m excited about the new year and the opportunities it will bring. People always say that December is slow. I do not know what they are talking about. For me, December is always ultra-crazy, both personally and professionally. For example, this year, I had to buy a new car because I was in a car accident, plus my wife and I just had our third child, and now we are in the midst of buying a new house, selling our old house, and somehow making sure Christmas comes off without a hitch. In spite of the controlled chaos, however, I find December to be an invigorating time. It is a bridge, a horizon, the meeting place of the dying year and the year still waiting to be born, and for me, there is a significance to that. I like to somehow carve out a little bit of time to consider the departing year, to look at my successes and my failures, and to figure out what I have learned. Or maybe to figure out what I should have learned. Annual reviews are important for us both as individuals and as businesses, but I think we can use many of the same strategies to harness the momentum of the past and use it to propel us into the future. For what it is worth, here are a couple of tricks I use in both my personal and professional lives. We all interact with hundreds if not thousands of people in any given year and many, if not most, of our conversations with them are completely inane. But somewhere in there, there is going to be some conversation that changed your life, even if you did not realize it at the time. The question, however, is did you let?it change your life, or did you just tuck it away? In your business, this may be an interaction with a customer, an experience with a partner, or maybe something as innocuous as a passing comment from a friend. The point is, what did you hear this year that opened your eyes and helped you see things in a different way. If you have not already, now it is time to think about what you can do differently to acknowledge that difference. It may be painful, but I find it important to remember the moments during the year when things were the worst. Maybe you were super stressed, maybe your job stank, maybe you were struck by a true tragedy. In any case, take the time to remember all the various influences that led to feeling that way and then consider what has changed. Have you resolved those influences? Have you learned from them? What defenses have you put in place to protect you from them in the future? I have found that it is way too easy to slog through some serious muck and then to just keep slogging. It does not get any better, I just get used to it. By taking a minute to consider the things in the year that really caused me pain, I can start making plans to improve things next year. One of the biggest challenges that any business faces is getting a handle on what is going on at any given time. Who is visiting your website? What are they doing? What do your customers need? What do they already have? How effective was this promotion or that sale? In our own lives, however, we run into the same trouble. How is my family doing? Are they happy? Are they stressed? Am I doing everything I can to take care of them? What have I accomplished this year? Did I make any goals that I did not meet? By taking an audit of what you know, you can make a plan next year to tackle that information you do not have. Keep in mind that this is not necessarily a goal-setting exercise. The point is not for you to focus on the things you did not get done, but to try and understand what you can actually reliably measure and then consider if that is enough, or if you need to do more. Standing on this doorstep between 2012 and 2013, take the time to think about the past and let it help you define the future. You do not have to use my strategies, but I encourage you to do some kind of year-end review, both of your company and of yourself, so you have the information and experience you need to succeed in 2013. This entry was posted in Business Tips by Stuart Auld. Bookmark the permalink.